Decker, Emy and Porter, Seth. 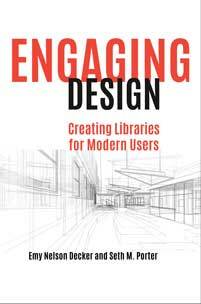 Engaging Design: Creating Libraries for Modern Users. Libraries Unlimited, 2018. ABC-CLIO, publisher.abc-clio.com/9781440856136. This book demonstrates how aesthetics, design elements, and visual literacy can be implemented in the library to enhance spaces, programs, services, instruction, and outreach so that your library will appeal to all users.